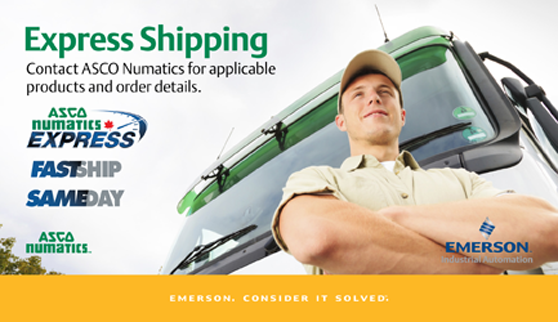 ASCO Numatics’ Express Shipping Program features thousands of the most popular fluid automation products and accessories available for shipment the same day or within one day of being ordered. This customer excellence program offers quick shipment of products such as RedHat Valves, Directional Control Valves, Air Preparation Equipment, G3 Fieldbus and Cylinders, and shows our undeniable commitment to our customer base. >> Shop now for thousands of ASCO Numatics’ most popular products and accessories.